Musings from Marilyn » Power Red Chanel Lips and Nails of the ’80s! Posted August 27, 2016 by finnfemme & filed under Beauty, Fashion, Vintage. Chanel, in the 1980s, was emerging distinctively under its fashion designer Karl Lagerfeld. This 1985 ad shows deep, bold RED lipstick and nail polish, as befitting the shoulder-padded-power-suit-wearing style that was so chic in in that era. 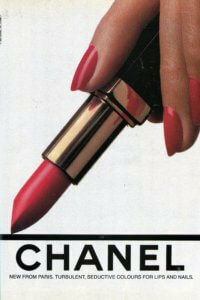 Chanel Red remains a classic to this day, but it was absolutely perfect for that statement-making ’80s fashionista!